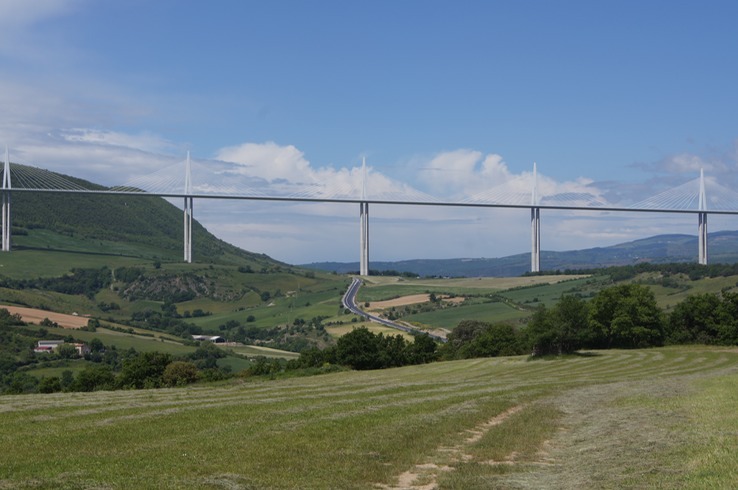 Driving the Bixie train in high winds can be tricky at times, especially when crossing bridges but nothing compared with the Millau Viaduct. What a spectacular feat of engineering that is! I might have also said, 'what a spectacular view', but I can't, 'cos I was concentrating on keeping moving forward in a straight line; it’s awfully high up, up here! 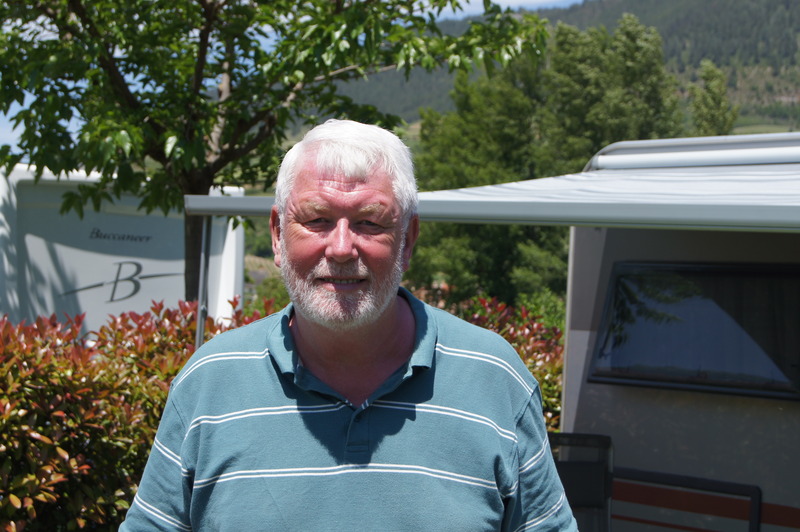 Our trip from Avignon to Rivière-sur-Tarn went via Montpellier and we are now west rather than any further north of Campéole L'ile des Papes. However, we are around 700 metres above sea level. We had to take the crawler lane a lot of the time on the way up, reaching over 800 metres on occasions. Maya was asking for oxygen; I was asking for a larger engine. This site and the area is breath-taking! Instead of a 4-day stay, we've already extended to 10th June. 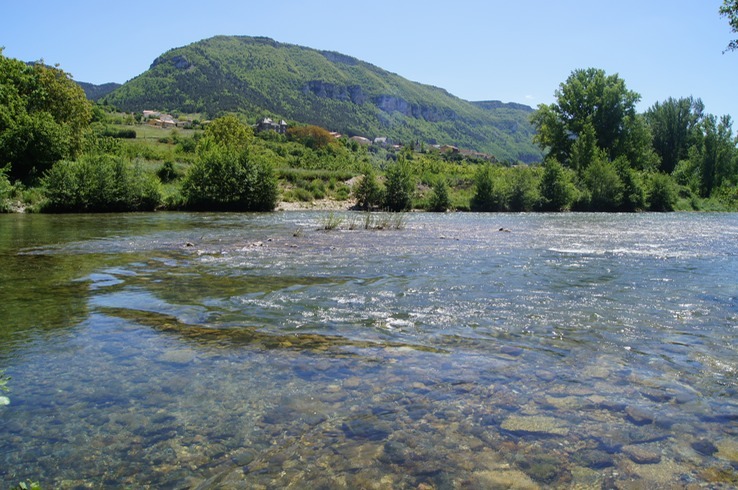 Mountains encircle us and we are on the banks of the river. Our pitch is perfectly positioned for the satellite, through a gap between two peaks, to allow Internet and TV. The church bells are peeling, last heard in La Romieu, sounding better than Maya woofing! We are treated to both, of course. This area has beavers, bats and vultures, though we haven't seen any yet. We haven't looked! If we were fit and active, we'd be planning a walk round the gorge! Yesterday, the weather was perfect - blue skies, sunny, hot (sorry to rub it in); we did little but sunbathe and read our books. We did walk into the village to get our baguette. The boucherie was also open - on a Sunday morning - so we made a purchase there too. We are considering a river cruise down to the viaduct, maybe it will be easier to look up than down. This is another site we'd consider coming back to for a lengthier stay. We love this nomadic life! Can't believe it's Wednesday already - this is the most incredible place, so beautiful, everywhere you turn is a treat for the eyes. We had a lazy day on Monday and the weather encouraged us to do so - lazed by the pool in the afternoon. The village here is lovely, strange habits though. Both bakery and butcher were open on Sunday, but closed on Monday! There is a small supermarket and a hotel/restaurant. 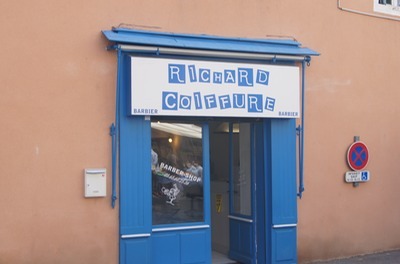 We were told that much further down the street, there is a cheese maker, who opens only on Tuesdays and Thursdays - makes a Roquefort type cheese that is apparently very good. Guess that's where we will go tomorrow. 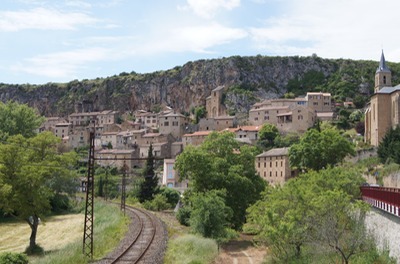 Yesterday we drove from here, through the village of Aguessac, the town of Millau (stopped by the information centre for the Viaduct - very interesting). 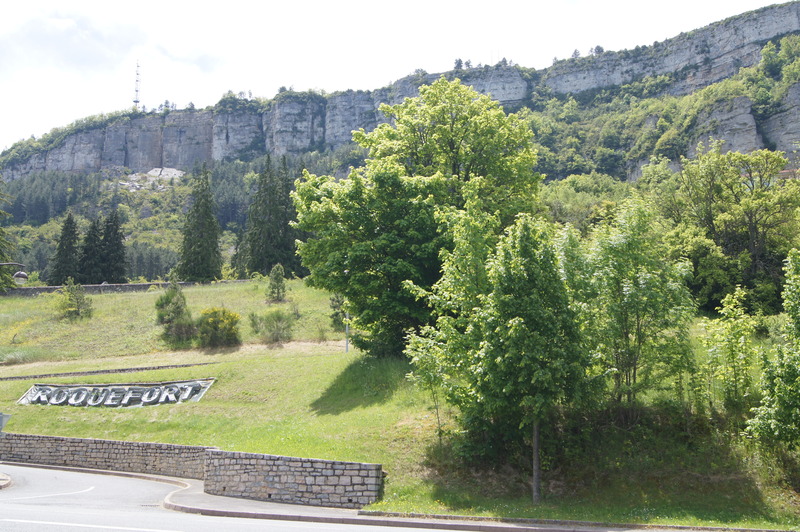 Onwards then through Criesells, stopping by the Aire de Vision du Viaduc for some photo opportunities - it is an amazing structure, so imposing but in no way detrimental to the surroundings. Ending our circular tour by passing through St Rome de Tarn and one of the most beautiful villages in France, Peyre - got lots of photos. Back to the site in time to get ready for our meal out in the local restaurant. We asked for an outside table, and they looked at us as if we were very strange! It was over 20 degrees but they thought that was cold. Not where we come from, we said, so out we went. Meal was good, and the Yorkies will benefit from some left over duck with their dinner tonight, too much for me. The cabaret was a wee red squirrel who kept us amused. There are some nice friendly Brits on this site - couple next door from London, next to them a couple of Geordies, and across from us a couple from Callendar. Lots of chat! Today, Vendredi, was full of action! We were booked to go to the Millau Friday Market on the site minibus. Departing 9:00 pick up for return at 11:45. This was, for the most part, a real market. It looked like all the locals were there to get their weekend fresh produce. There was much less 'tat' than we have seen in other markets and we did make some purchases. But, you will not believe this, we found ‘un homme barber’!!! I feel I am looking tidier around the visage. Actually, I am quite pleased. Margaret also acquired new Fly Flots; new, very comfortable shoes. They look great! Half way through the day and there is more! We set off tomorrow for Sarlat in the Dordogne : to Domaine de Soleil Plage, France - Aquitaine – Sarlat.